While I love the juxtaposition of lots of colors, textures and prints (more is always more) I sometimes love the serenity of all white rooms. I recently came across these two beautiful images on Decor8 and I can’t help but drool over the this beautiful home. I love the crochet covers on the bed. I especially like the contrast of the white cover with the beautiful cream cover. I obsessively searched eBay for a while for vintage crochet bedspreads. I wanted one that I could dye black but they all ended up being too granny-ish that I didn’t end up buying anything. Seeing this picture has re-sparked my eBay search for crochet blankets! The bright clothes pop nicely against the all white decor. 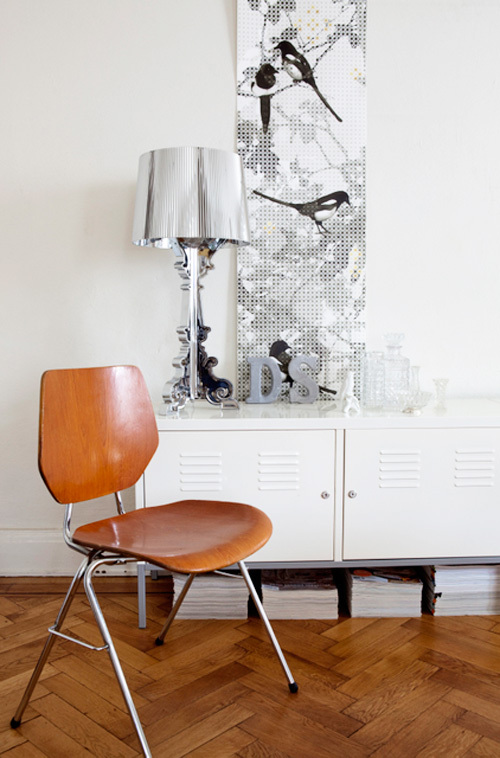 I think the light fixture is a Tord Boontje garland that I have been lusting after for ages. I have no where to put it so I have resisted the urge to buy it. Speaking of lamps I have also been lusting after a Bourgie lamp like the one below. I prefer the completely clear one and once a lot of the major renovations are done I may buy one. It is sort of way out of the league, in terms of cost, compared to all my other thrift store lamps. I am not sure if there were ever a time that I didn’t have any major renovations to do that I would actually spend that kind of money on a lamp. For now I am quite content thinking that I may buy it. I love the mix of high and low in the picture below, the amazing lamp is sitting on an inexpensive Ikea cabinet and looks stunning. There is no chance that I am going to paint my walls white (any time soon) but I love adding lots of white furniture and accessories to the room. White makes it easier to live with lots of color. I shall go to bed tonight dreaming of the Bourgie lamp. « Still Dreaming of a Black Room.